Vendor Sale at Krombholz Jewelers! 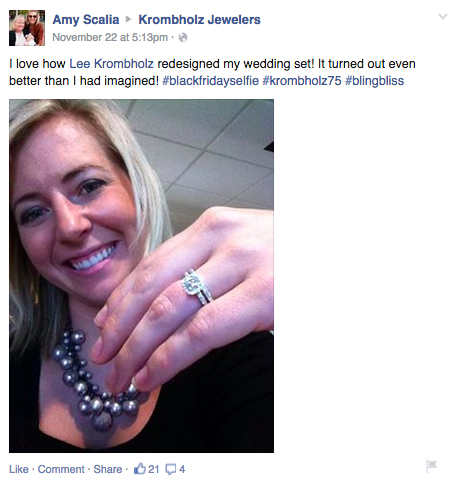 Lots going on at Krombholz Jewelers these days! (I would be celebrating too if I was turning 75 years old!) 🙂 They’re having their Annual Vendor Sale Dec. 5. I loved going to this event last year, and got some GREAT deals. 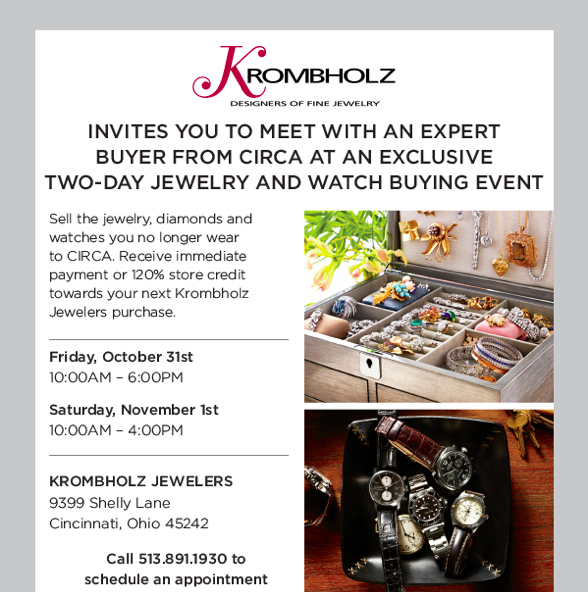 Basically, Krombholz invites all the jewelry brands they work with to host a trunk show to liquidate that season or year’s collection. So, you’re going to get the best deals of the year at this sale and get the items before they’re gone! Oh, and enjoy light bites and drinks while you’re shopping…doesn’t get much better than that! Krombholz Jewelers Hosts Lilly Pulitzer Happy Hour this Friday! In addition to Krombholz’s glitz and glam, you’ll also get to check out Lilly’s newest fashions, while sipping on some springtime refreshments from 4-7 p.m.
Princess Diana Exhibit Coming to Cincinnati February 14th! The Princess Diana exhibit will open at the Cincinnati Museum Center February 14th through August 17th. Cincinnati is the final stop for the exhibit that has been touring since 2003. There will be 150 objects on display at the museum including dresses highlighting Princess Di’s style and family heirlooms. Krombholz Jewelers previously made a replica of Princess Di’s engagement ring which has already been sold. The jeweler also made replica earrings similar to the ring that are currently being auctioned. You’ll see the earrings on display at Krombholz Jewelrs until the Exclusive Premiere event at the Museum Center on February 12th. If you’re interested in placing a bid on the earrings, you can do so by clicking here until February 11th. The proceeds from the ring and earrings will go to the Cincinnati Museum Center. Click here for your chance to win tickets to the premiere. Visit the Cincinnati Museum Center’s website for more information on the exhibit. 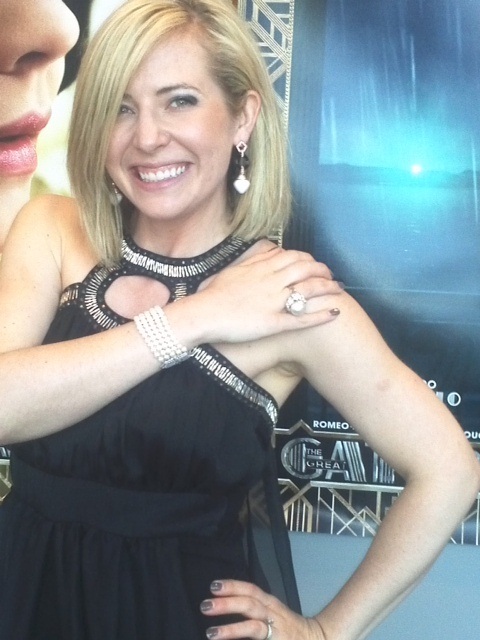 I just went to a screening of The Great Gatsby earlier this week and LOVED it. Today, I saw the below press release come through from one of our jewelry designer clients, Krombholz Jewelers, and thought it had lots of great info about fashion trends emerging from the movie! DEFINITELY go check out the flick! The fashions are fab!!! My outfit for the premiere! Dress by Amy Kirchen and jewelry by Krombholz! The new “Great Gatsby” film is inspiring more than just movie ticket sales. Fashions inspired by the Roaring 20s era are rushing to racks across the nation. 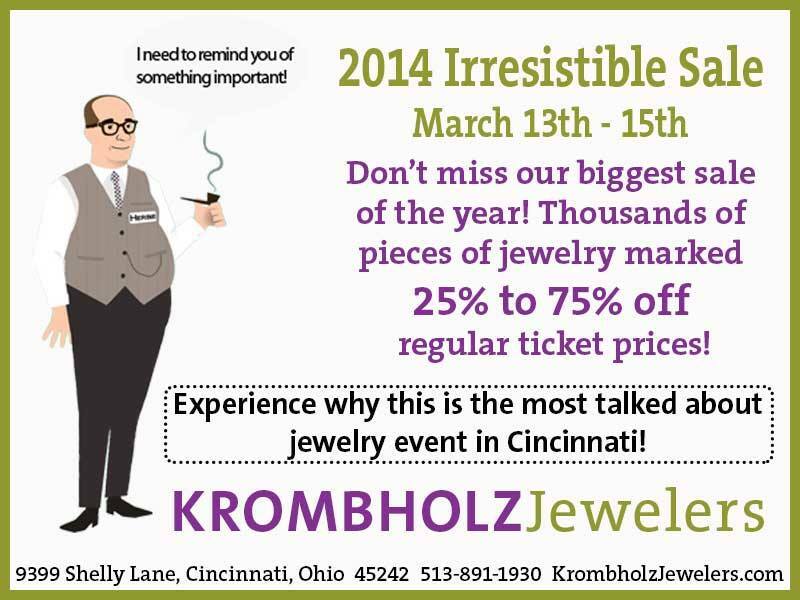 Cincinnati-based Krombholz Jewelers is no exception. According to owner and lead designer, Lee Krombholz, this art deco era is one that’s always inspired him and been featured in-store. Now, because of the film, designs from the 20s and 30s are being showcased at Krombholz Jewelers more than ever. The story takes place in 1922 which was known as the prime of the “Roaring Twenties.” As women gained the right to vote in 1920, they felt that they had more freedom. Dresses were shorter, make-up became more prominent, hair was cropped into a “bob,” and the look of the flapper was created. 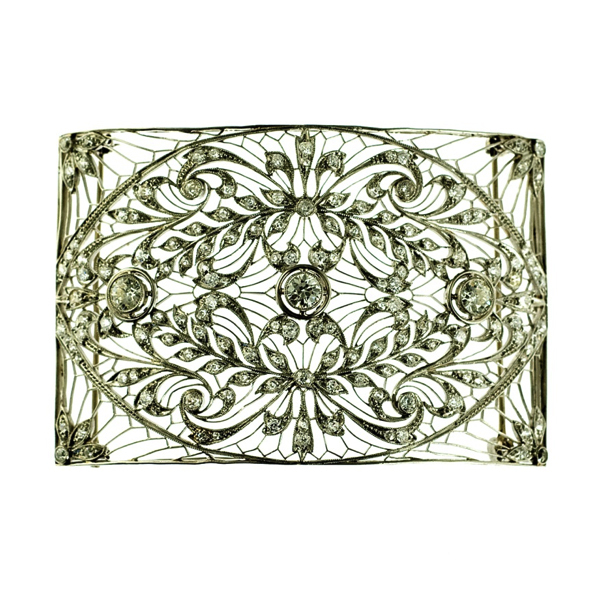 Art Deco style was everywhere, in both architecture and jewelry. Popular stones embellished in these art deco settings were emerald, ruby, marcasite, pearl and ivory. Jewelry was used to pull the whole look together, to compliment the dress and to soften the look of the short hair. 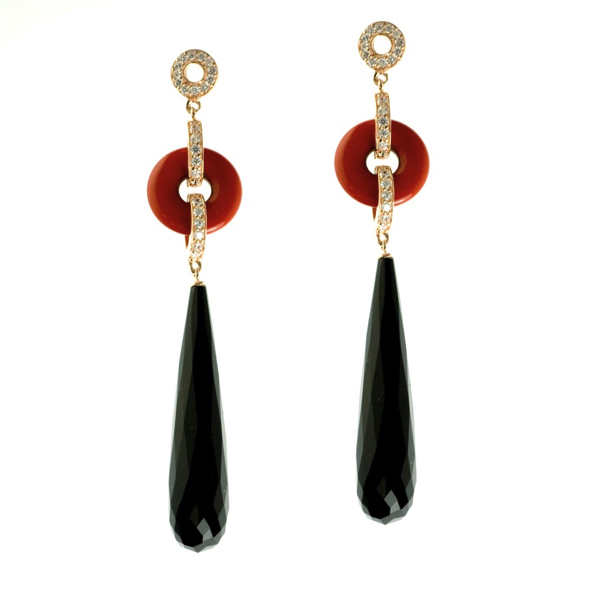 Dangling earrings became immensely popular as well as long strands of beads and stacks of bracelets. It was all about glamour so crystals and rhinestones became trendy. – Filigree buckle, that is Edwardian and ornate with detailing you would see beginning in the 1910s and continuing through the 20s and 30s. – A dress clip, originally a pair, these clips would have been symmetrically placed on a dress. 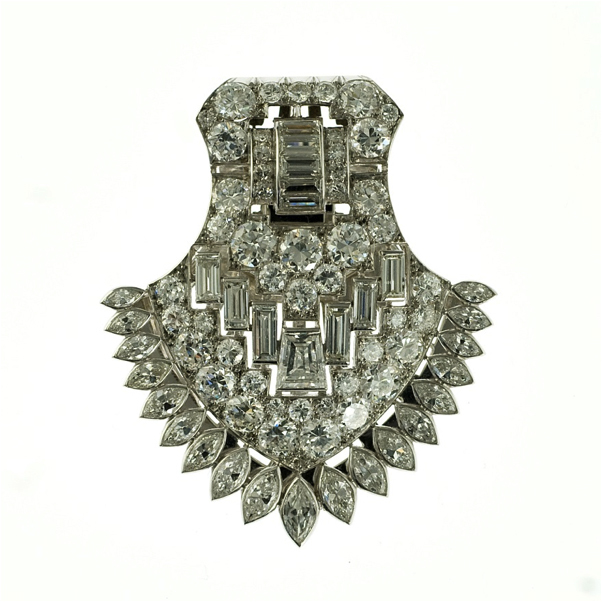 Both baguette and marquise diamonds were used in design to give the piece an art deco feel. The absolute flashiness of the piece reflects a time of opulence and glamour, which the movie portrays. 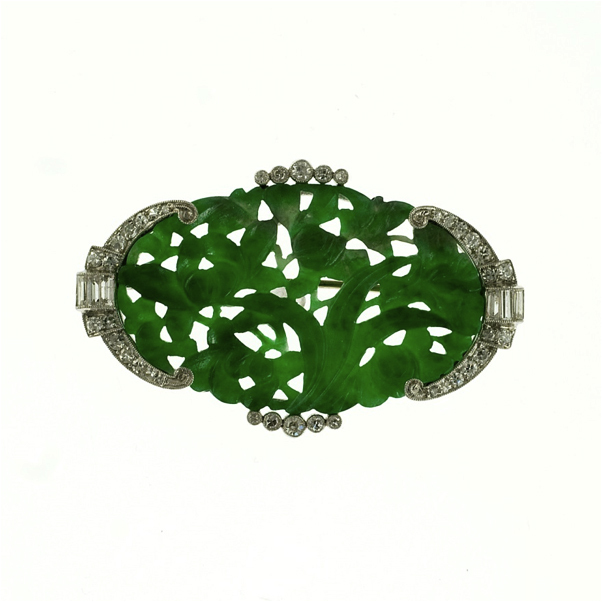 – A jade and diamond broach. About a decade earlier, Asian influences became very popular in jewelry. This carried over to the 1920s and this piece displays ornately carved jade with platinum deco embellishments. The Great Gatsby film, based on the novel by F. Scott Fitzgerald, will be in theaters on May 10. 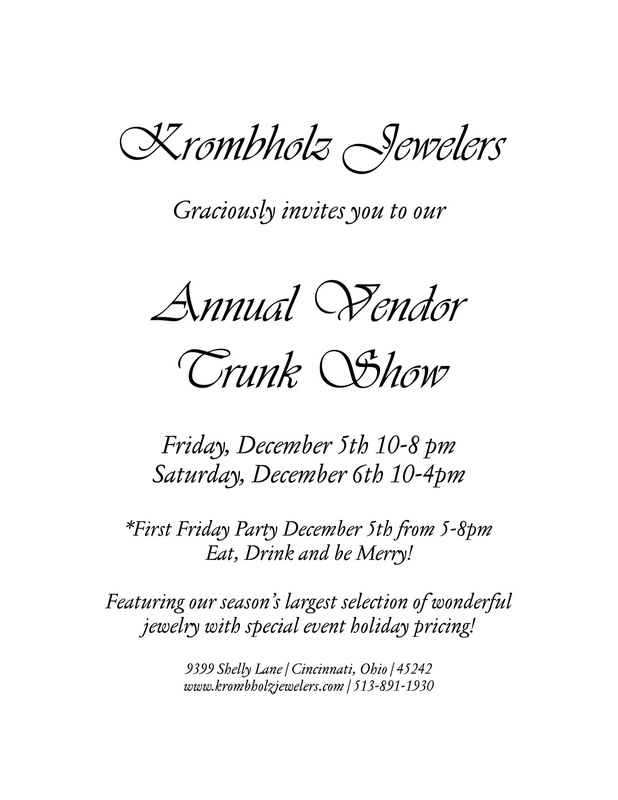 Krombholz Jewelers is located at 9399 Shelly Ln Cincinnati, OH 45242. More information available at www.krombholzjewelers.com. On May 3, my Cincy Chic team and I hosted our fourth annual Night in White event at 21c Museum and Hotel! It was such a HUGE success! We selected a new venue (it’s been at Krombholz Jewelers for the past three years), and it was fabulous! If you haven’t been to the 21c yet, I highly recommend it! It’s actually free to view the museum and it’s open to the public 24/7! Click here to see photos that the Cincinnati.com photographer snapped at the event, and click here to see all the fun photobooth photos! Also, True Artists Studio got a sneak peek of Cincy Chic’s 2013 Night in White event as Heyman Talent Models were fitted by FashionCincy.com at Alligator Purse, Curate Boutique and Krombholz Jewelers for their looks at this year’s fashion show. So, if you missed the show – or even if you were there, and just want to see all the fab fashions again – this is a great video showcasing all the styles in the show. Enjoy! Me with local stylist and fashion blogger Ashlee Mello at last year’s Night in White event. Click here to view more pics from last year! Who said you can’t wear white before Memorial Day? Cincy Chic is not only making it fashionable, but also philanthropic as it hosts its fourth annual “Night in White” event on May 3, from 8-11pm, at the 21c Museum Hotel downtown. At this event, guests will enjoy cocktails, desserts, gourmet coffee, photo booth, fundraising activities, silent auction, a viewing of the new 21c art gallery, and a spectacular fashion show sponsored by Krombholz Jewelers and styled by FashionCincy.com. All proceeds will benefit the Eight Days & One Hour Foundation’s Stephen Jason Morsch Nursing Scholarship, which was founded by Stephen Smith and his Cincinnati-based family. This year’s Night in White event will take place at the 21c Museum Hotel, located at 609 Walnut Street. Tickets are $35 dollars for general admission and VIP tickets can be purchased for $65. Donations are also welcome. Tickets may be purchased here online. Dress for the evening will be “white cocktail chic” with statement jewelry. Click here for style inspirations we put together on Pinterest!